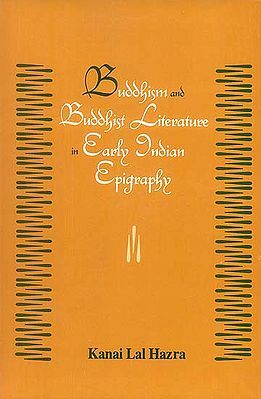 This book has tried to study systematically Buddhist religion from its inception till it became a vibrant religious faith in early years and as thousands of men and women became the disciples of Buddha, due to novelty of this religion and his skill of oration and discourses also influenced by towering personality of the Buddha. The laities also played a significant role to establish this young religion on solid footings. They liberally donated money, alms, food, medicines and all other necessities for the monks and nuns and helped to establish the monasteries for their living. This book meticulously describes various pious deeds of the laities and specially ruling monarch's patronisation of this religion. In this respect, author traced the role of royal patronisation up to the time of Emperor Asoka, the greatest and generous Buddhist king of all the time. Dr. Gayatri Sen Mazumder is well renowned research scholar on Buddhist Studies. She obtained her Ph.D. degree from University of Calcutta in 1977. Her thesis, BUDDHISM IN ANCIENT BENGAL was published in 1984. She received U.G.C. Research Associateship in 1985, also received the prestigious Dr. B. C. Law gold medal. Apart from that, her work as U.G.C. Research Associate namely, India as known in the Anguttara Nikaya (Pali Text) is a forthcoming. She spents her time in writing articles in academic Journals, Commemorative volumes and participating in various seminar on Indology held at different places in India. She is engaged in publishing a Journal on Indian History and Culture named KALYAN BHARATI for long eleven years under her editorship. I am delighted to read the book entitled 'Early Buddhism and Laity' written by Dr (Mrs) Gayatri Sen Majumdar. This is an informative monograph on the origin and development of Buddhism in its early stage and organisation of its institution of monks and more than all this, the wide support given to the new religion by the kings, royal officers and common peoples. The author has drawn extensively on original and secondary sources. Her exposition is simple and impressive. This book is a valuable addition to her earlier book 'Buddhism in Ancient Bengal.' The present work has a wider canvas. This makes the book more engrossing. I congratulate the author for writing this book on a fascinating subject. The present work substantially embodies my post-doctoral dissertation 'Early Buddhism and Laity', submitted to the Ramakrishna Mission Institute of Culture, Department of Indological studies and Research (Golpark, Kolkata). This monograph entitled the 'Early Buddhism and contribution of laities' is the fruit of my research work at Ramakrishna Mission Institute of Culture, Gol Park as Post-doctoral Research Scholar. I feel myself fortunate enough to get this opportunity to continue my research on Buddhism in this renowned Institute after the completion of my research as U.G.C. 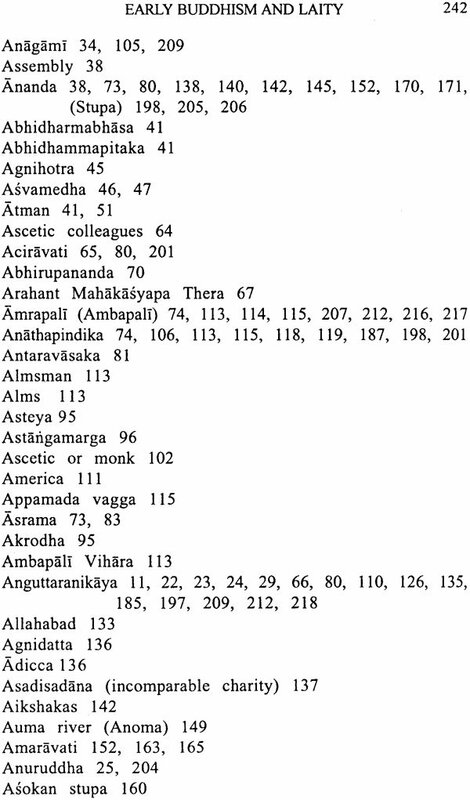 Research Associate entitled 'India as known in the Anguttara Nikaya' (Pali text). In the present work, I made best effort to find the beginning of Buddhism, its origin, development and spread, the help and assistance received from the laities in money and kinds. 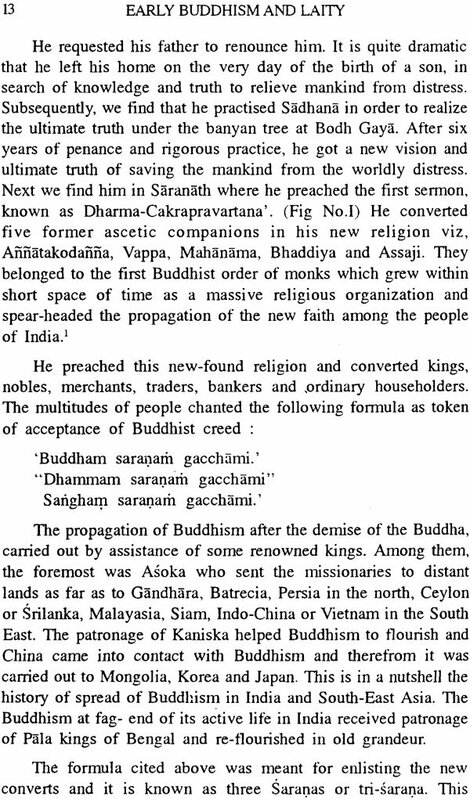 As a result, Buddhism engulfed not only the whole of India but also the foreign land due to the active participation of missionaries and lay votaries. I cannot say howfar there is my success in this matter and I shall be glad if my endeavour is appreciated by learned readers. At first, I acknowledge my gratitude to Ramakrishna Mission Institute of Culture specially to the Secretary of the Institute, Revered Swami Prabhananda Maharaj for giving me opportunity to work as Post-doctoral Researcher. It is a great providence for me to receive affection and blessings from Swami Prabhananda Maharaj, whenever I met him. I am happy to complete my work within stipulated time of three years. I owe a deep debt of gratitude to the eminent scholar and Indologist, Dr Pratap Chandra Chunder under whose critical and stimulating guidance, I have prepared and completed the present dissertation. I am also grateful to Dr Sacchidananda Dhar of this Institute for his valued suggestions and advice. Swami Sarvabhutananda Maharaj, Department of Indology has always given patient hearing to my requirements and provided the same. I express my thanks and regard to him. I recall respectfully the blessings and well wishes received from Swami Balabhadrananda Maharaj, Assistant Secretary of this institution during my tenure. I am also indebted to Professor Visvanath Chattopadhyay former professor of English in Jadavpur University and Professor Devabrata Sen Sharma former professor of Sanskrit in Kuruksetra University for their kind suggestions and encouragement. My heartfelt thanks to Sri Joy Bhattacharya, Sri Subhasis Chowdhury, Sm Deblina Roy, Kumari Gargi Dey and Dipa Bandopadhyay, Krishna Lodh, Arpita Chatterjee and Swati Bhattacharya and other scholars and I fondly remember my association with them. I am thankful to Sri Amiya Sarkar, Sri Jivan Acharya and Sri Subrata Mukherjee and other staff of the Research Department for their sincere co-operation and services. I fondly remember my brother late Professor Kalyankumar Dasgupta, an eminent professor and scholar who first suggested the name of this topic but unfortunately he could not see the completion of my work. My mother late Suprity Dasgupta always encouraged me in the matter of studies and research. I pay my homage to the memory of my mother and brother, also to my father late Professor Harendra Mohan Dasgupta who died in my childhood. I convey my heartfelt thanks to Mr. D.L.S. Jayawardana, propietor of Mahabodhi Book Agency for publishing my monograph within a stipulated time and extending co- operation. I acknowledge with thanks for the printing of illustrations in my monograph from the books of the following authors. 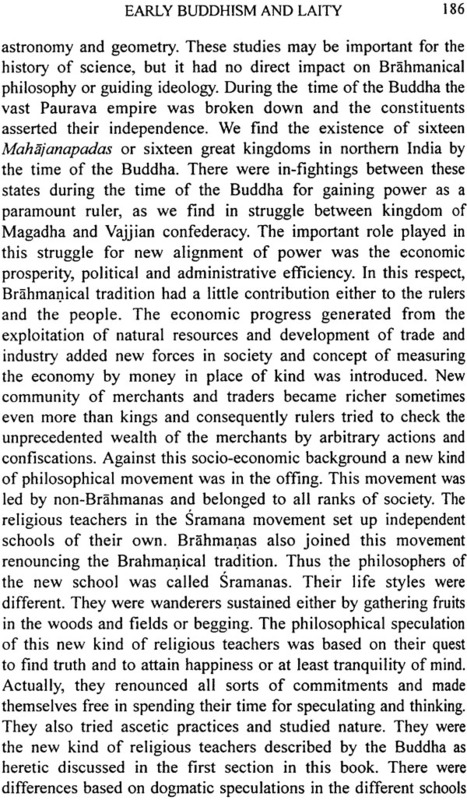 R. C. Majumdar(ed) Age of Imperial Unity. Richard Gomrisch and Henry Bechart, world Buddhism. A. L. Basham, wonder that was India. I owe my gratitude my husband Sri Tapas Sen Majumdar for his eneouargement and help. Lastly, thanks printer Sri Dilip Roy for his active co-operation and meticulous care for printing of this monograph. Buddhism is a wonder in annals of world religion. Its message of humanism, peace and tranquility and simplicity in religious exercise bereft of any sort of ritualism, attracted the people of ancient India, later to people of outside India. As such the study of Buddhism in different aspects is a fascinating subject for the scholars of all time. 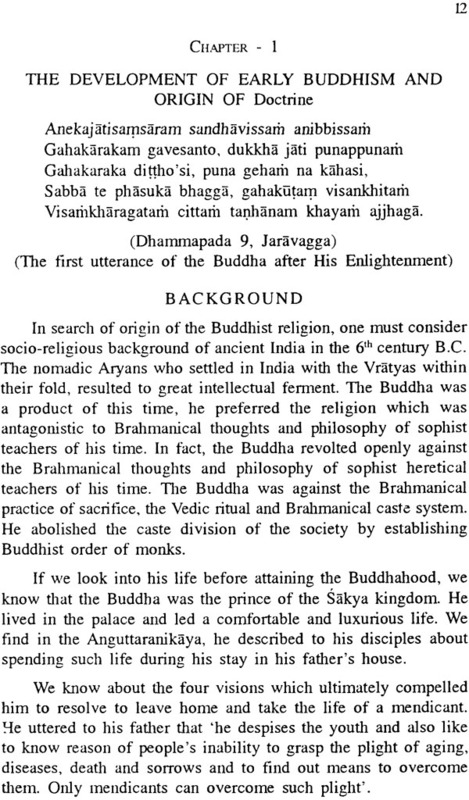 The decadence of the Buddhism in India started long after the demise of the Master at the time of Hindu revivalism under Shankaracarya and rejuvenated again for a short period under Paramasaugata Pala kings of Bengal in 10th-12th cent A.D., but it eclipsed almost totally from Indian soil during the time of Muslim invasion and occupation of this part of India. So, inquisitiveness for this religion remained dormant during the Muslim period but again revived during the time of British occupation by some English men. In fact, the interest of the Western scholars were awakened through Buddhist canonical manuscripts; the original Pali manuscript is not found and the studies are made mainly on Sanskrit, Sri lankan and Chinese versions. Here, we are not only indebted to the pioneers in the field of reserach based on Buddhist holy literature but also the archaeologists of 19th century who laboured hard to search and find out the spots associated with the Buddha and Buddhism. In this respect, we must remember the name of Cunningham whose untiring effort could un-earth many archaeological sites, ruined cities and buildings. The recovery of ancient relics helped to reconstruct the history of Ancient India. Cunningham started his research on the Buddha's birthplace, the place of his Parinirvana and renowned cities and towns of Buddha's time. In his quest, he followed itenary of Hiuen Tsang in his travalogue; the famous Chinese pilgrim visited different places in India in the 7th century A.D. 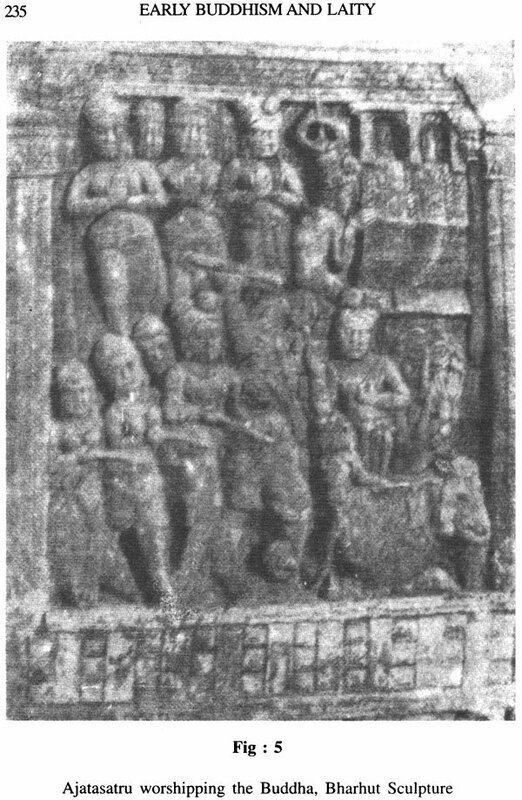 It is a thrilling story of untiring effort of Cunningham and his close associates and they met with success to find out the sites and its excavation identified the birthplace of the Buddha at Kapilavastu, Kusinara, the place of Lord's Parinirvana and other places like Sravasti, famous ancient city associated with the Buddha and his disciple Anathapindika. This dissertation is written mainly based on literary sources. The Buddha's life and principal events are well known. His appearance in 6th century B.C. was remarkable in many respects; two greatest preachers outside the Brahmanical fold, the Buddha and Mahavira played a significant role in the field of traditional religious thoughts. Both religious teachers preached non-violence and developed new kind of religious concept. 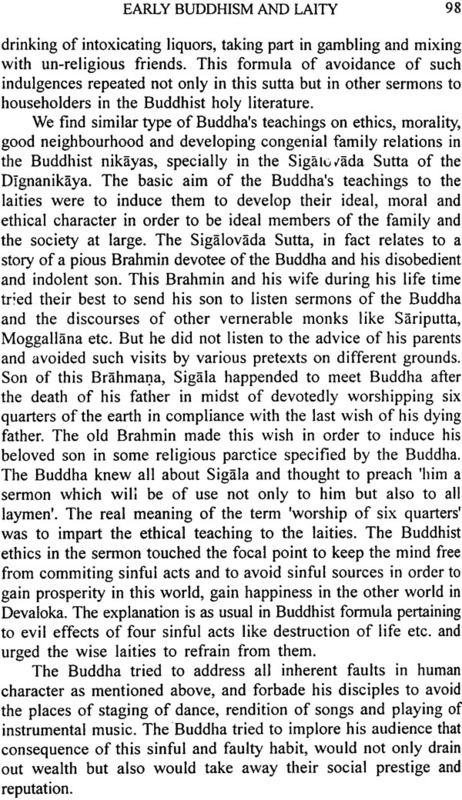 The Buddha was born in the family of Brahmanical faith and inherited the ideals from the past tradition and ethos. In fact, 'The Buddha did not feel that he was announcing a new religion. He was born, grew up, and died a Hindu. He was restating with new emphasis the ancient ideals of the civilization' and the Buddha remarked 'Even so have I, monks, seen an ancient way, an ancient road followed by the wholly awakened ones of olden times ... Along that have I gone and the matters that I have come to know fully as I was going along it, I have told to the monks, nuns, men and women lay-followers, even, monks, this Brahma-fairing, Brahmacariya i.e., prosperous and flourishing, wide spread and widely known, become popular-in short, well made manifest for Gods and men'. 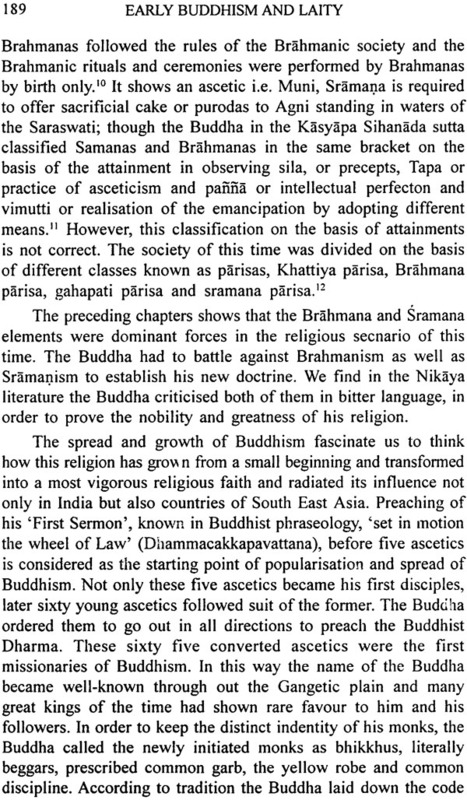 In fact, the Buddha in his Doctrine tried to present a religion, bringing innovation of Vedic religion and Upanisadic ideal. The question may arise in our mind about the real nature of Buddhism. Traditionally, one to be a Buddhist must take Trisarana, by uttering the vow that he takes refuge to the Three Jewels or Triratna, i.e. 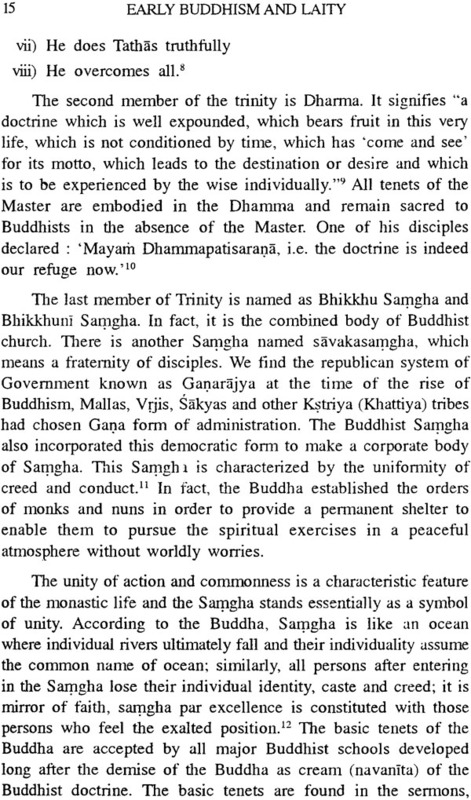 Buddha, Dharma (Doctrine) and Samgha (the community of monks). 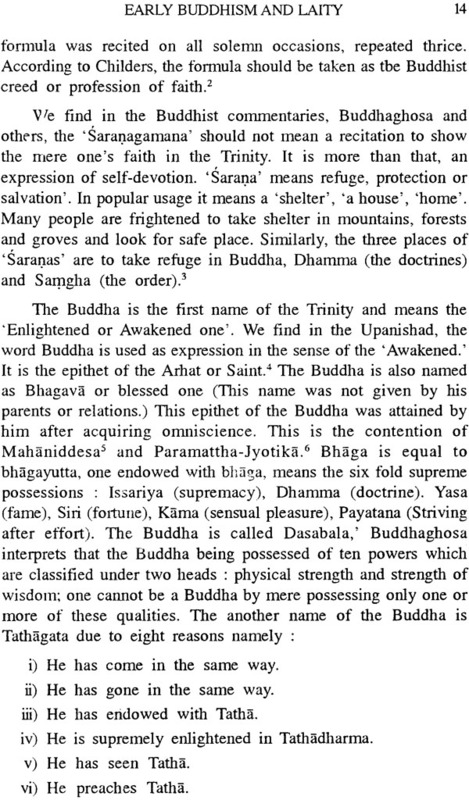 The term Dhamma or Dharma is associated with Buddhism and the question remains to find nature of early Buddhism and its philosophy. 'The answer is that so long as religion is thought of in exclusively theistic terms and philosophy, remains divorced from any kind of ethical and spiritual discipline, Buddhism is neither." The Dharma is the teachings of the Buddha compliled in the Buddhist Tripitaka in the form of Sutras in a stereotyped formula repeated in order to help the disciple to memorise and consists of three Pitakas viz, Vinayapitaka, Suttapitaka and Abhidhammapitaka. The Vinayapitaka relates to code of conduct, rules and regulations for the guidance of the Buddhist church and also for personal conduct in the daily life of monks and nuns. The Suttapitaka consists of the Dighanikaya, the Majjhimanikaya, the Samyuttanikaya, the Anguttaranikaya and the Khuddakanikaya which are the collections of exposition of doctrinal matter and lastly Abhidhammapitaka contains some subjects of Dhamma as compiled in Suttapitaka but only difference between the two, arrangement and treatment of the subject matter. 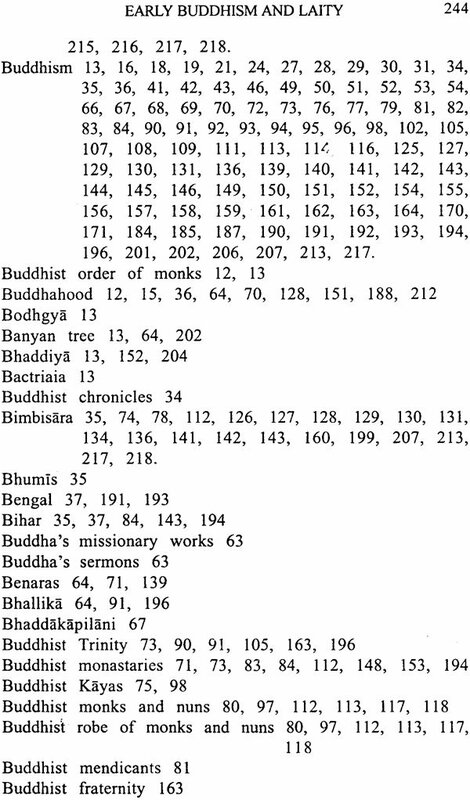 These are the whole corpus of the Buddhist religious texts, relates to the foundation of Buddhism. The Buddha's preachings, teachings, conversations as well as sayings, songs, narratives and the rules are included in these collections. 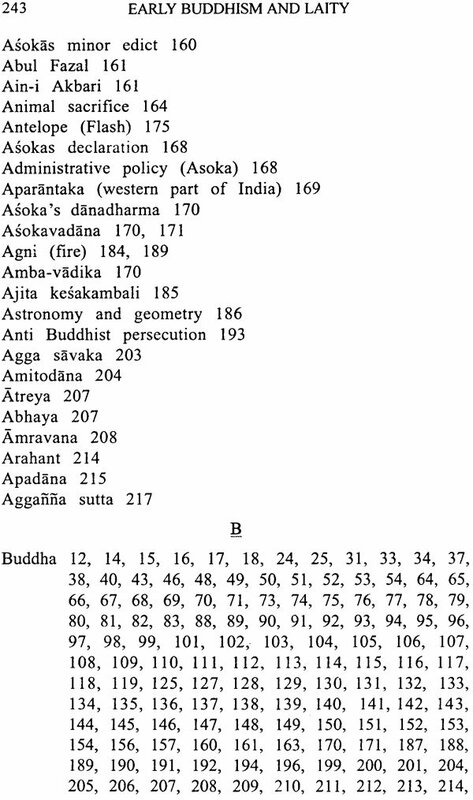 To study early Buddhism, we must add few more texts viz. 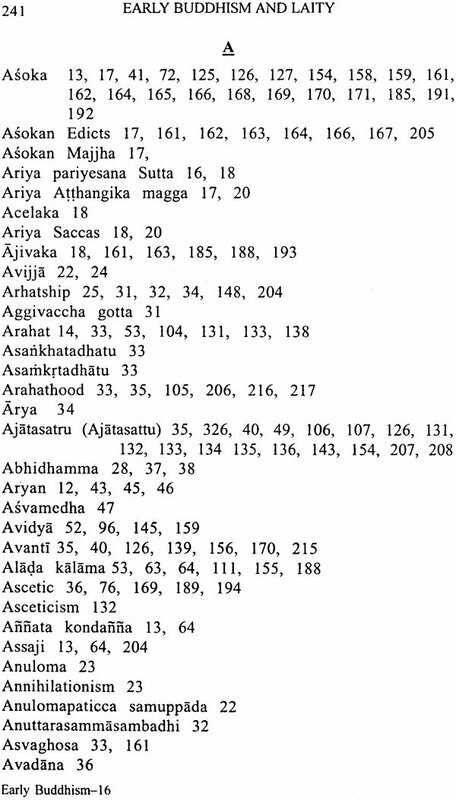 Khuddakanikaya, (Pali canon) and minor collections like Dhammapada, Theragatha and Therigatha and Jatakas. The term Dharma in Buddhism stands for law, truth, doctrine,, gospel, teachings, norms and ideals. It is believed that Dharma means the teachings of the Master and not by any other teachers. As a result, it becomes timeless in the practice and one's enquiring mind may get personal realisation through such practice and progressively lead him from lower to higher existence. 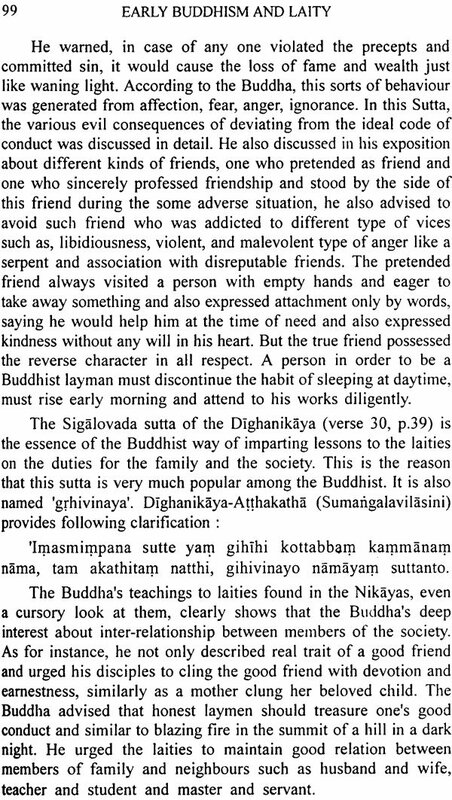 The Buddha did not write anything but spirituality of his teachings and personal examples were directly communicated orally by means of discourses and discussion with his disciples and general public (lay votaries) and inspired them by such spontaneous utterances. This oral tradition was followed after the demise of the Lord till the first Buddhist council, tried to compile the speeches and utterances. We are also in dark about the language used in these discourses and utterances, most probably it might be in dialects of Kosala and Magadha. Many of his disciples during his life time, had the apprehension that the Buddha's speeches and teachings might be corrupted in the process of repeating it by the monks belonging to various clans, castes or races in different regions in their own dialects and asked his permission to make it into Vedic verse. But the Buddha rejected the appeal and exclaimed 'The deluded man! how can you say this? This will not lead to the conversion of the unconverted and commanded the monks: 'you are not to put, the Buddha's message into Vedic' whoever does so shall be guilty of an offence. I authorise you, monks, to learn (and teach) the Buddha's message each in his own dialect (Sakayaniruttiya)." In search of the origin of Buddhism we must look into Vedic ethos, the cult of sacrifice which was entrenched in the minds of the early Aryans, which is found in the prayers in Vedic samhitas, elaborated in the system of rituals developed in this cult. In order to read the mind of the Buddha in formulation of his doctrine, we must know the basic points of Buddhism. The Buddha's quest for supreme knowledge was to find out the path of salvation of humanity from the sufferings generated from the cycle of birth and rebirth. The basic cause of the sufferings, or dukkha pin pointed in Buddhism four elements in life i.e. birth, disease, old age and decay. So we find, the Buddha's first debut after getting the supreme knowledge and fully awakened, he delivered a discourse in front of six former ascetic colleagues at Isipatana in Sarnath and this preaching, is known in Buddhism as the 'Dhammacakkapavattana sutta'. 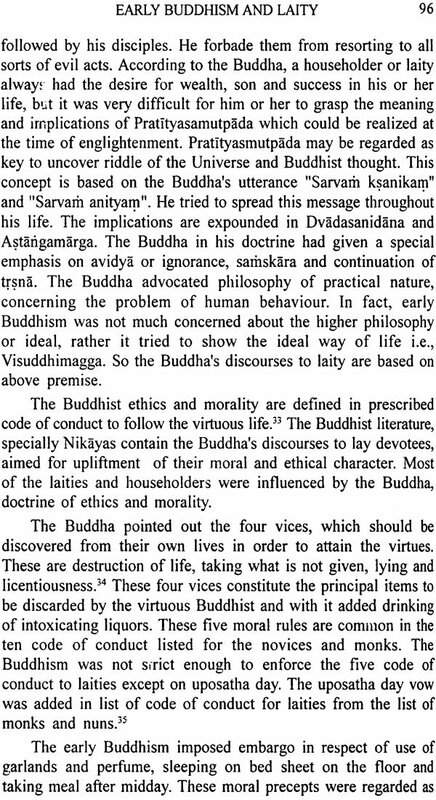 The basic premise of his new found doctrine is enunciated in this sutta. 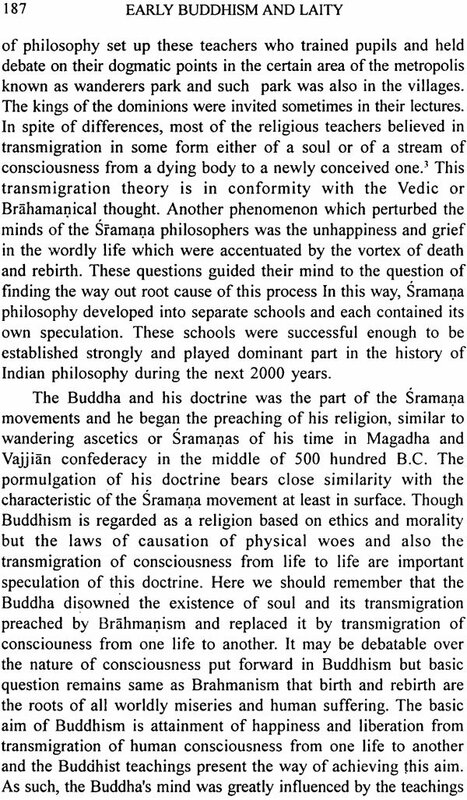 The question is whether the Buddha promulgated a totally new kind of doctrine divorced from Vedic and Upanisadic thoughts. 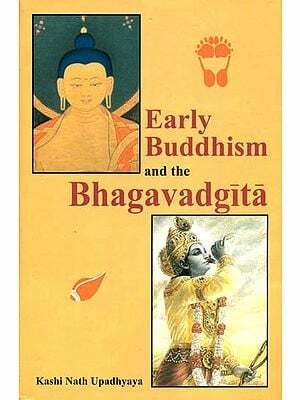 The chapter I contains a study in this respect to find the origin of Buddhism. In fact, the Buddha was greatly influenced by Vedic and Upanisadic thoughts and introduced the same in an innovated form. 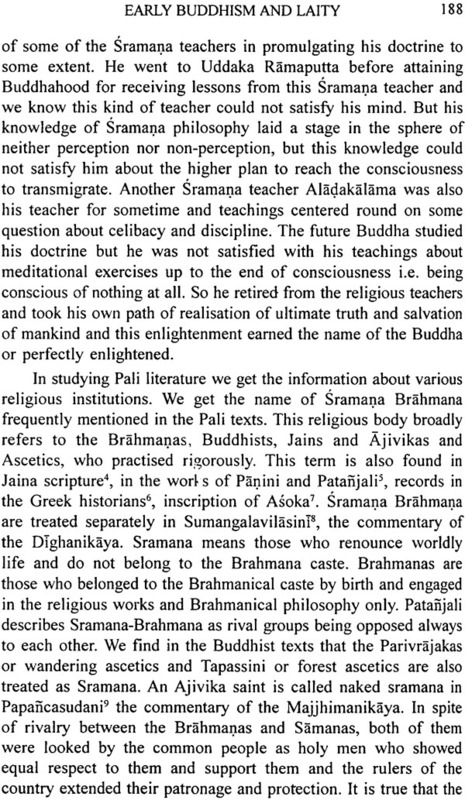 The Buddha did not disown the Brahmanism but he criticised ritualism and cult of sacrifice in the Vedic religion. In fact, he put forward a simple religious doctrine understandable by the common people in their own language and emphasised morality and ethics in order to elevate the people from the base of animality to the godly life. The Buddha was quite successful as a missionary to propagate and popularise his new found doctrine. He started his campaign from Magadha where he had a strong support base and royal patron Bimbisara, king of Magadha who was his great fan before engaging himself in rigorous ascetic practices. Afterwards, on the attainment of Buddhahood at Bodhgaya, the Buddha returned to Magadha, and received whole-hearted support from the Magadhan king. He provided at the disposal of the Buddha the resources of his empire. This royal patronage attracted the common people of Magadha to take Buddhist faith and other kings of neighbouring kingdoms and the heads of the republic or ganarajya were initiated to Buddhism. The common citizens followed the path of ruler of respective kingdom or republic. At this stage, we find that stream of men and women came forward to be converted and many of them embraced the life of Buddhist monkhood or nunhood. Many householders of these kingdoms preferred to remain as lay devotees and supported Buddhism. So there are two distinct divisions among the Buddha's disciples; those who renounced their family life to be monk or nun and others who remained as householders or laities. To understand origin and development of Buddhism, the position of Buddhist monks and nuns in the monastaries should be discussed. Buddhism is to prevail on people to leave householders life and to take to homeless life. As such the Buddha tried to convert men and women as monks and nuns as many as possible. 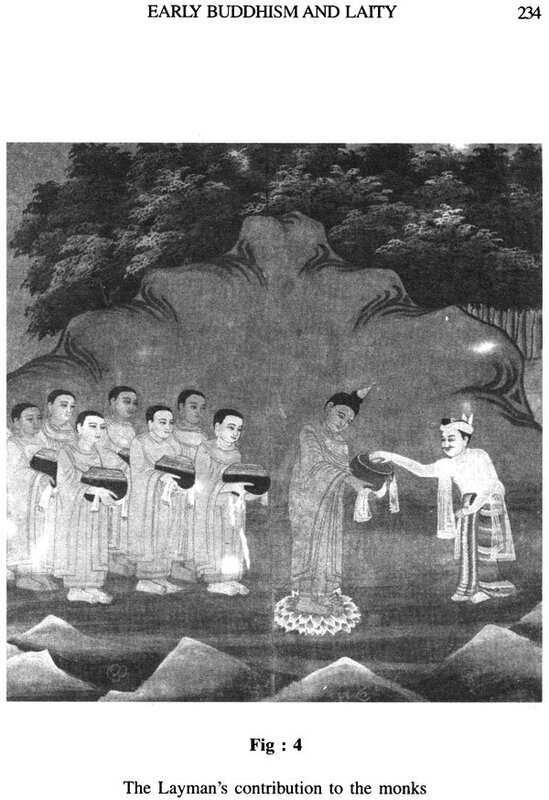 The lay votaries or laities provided constant nourishment to Buddhism by giving alms, supplying monk's or nun's robes and providing the items of necessities for sustenence. They donated land and buildings for monasteries. The Buddha's disciples monks, nuns and ordinary householders, and lay votaries are taken up in chapter II and III separately in order to get full insight about them in respective position in the Buddhist religion.